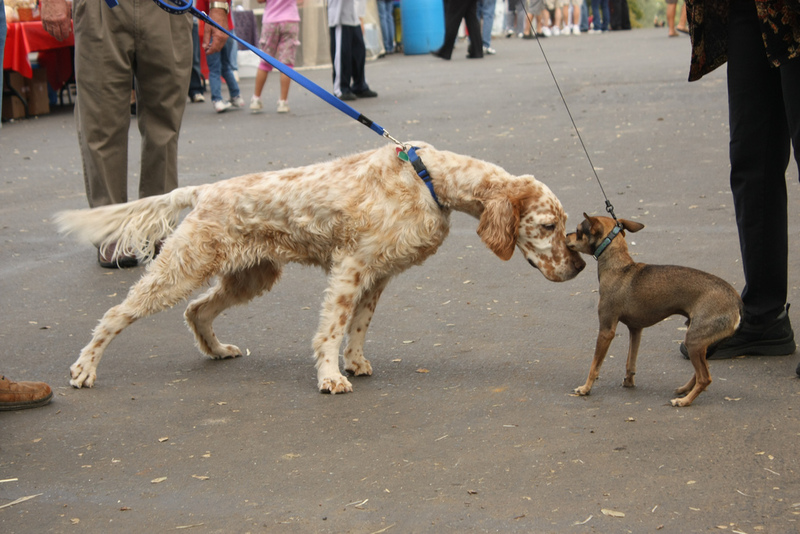 The Chihuahua's tucked tail and stiff, backward leaning body tell us he is not all that excited to meet a new friend. In a perfect world, every dog would be happy to see one of his kind on the street. He would politely walk up to his new buddy with a wagging tail and courteously sniff his rump, then the glands at his neck, and then back to the rump again before inviting him to play or continuing his walk. But in this world, only a fraction of our canine companions fall in to this category. The others are too flush with fear or aggression to respond with anything but barks and growls or avoiding the situation altogether by running the opposite direction or making themselves busy staring at the grass or a far-off fire hydrant. For those with the first kind of dog – the friendly, polite kind – it’s sometimes hard to remember that not every dog is as well-mannered as yours. So how do you great a new dog that could be frightened or mean? First of all, if you are in an off-leash dog area and you see a dog on a leash, do everything you can to avoid a meeting between your dog and the leashed dog. That dog is leashed for a reason and it probably has to do with the way he reacts to strange dogs. Granted, most owners of fearful or aggressive dogs will not bring their pups to a dog park but there are plenty of hiking trails and parks where a majority of folks do not have their dogs on a leash. In these cases, call your dog back to your side or even temporarily leash him if you must so as not to stress out the other dog and cause a dangerous reaction. When you pass another dog on the street there are a couple of ways to tell if they want your dog to meet yours or not. – If you notice them tensing up or shortening the leash as they approach you, do not greet the dog. – If the owner switches the side of their body the dog is on or moves farther to one side of the sidewalk, do not greet the dog. – Listen. It can be frustrating, even embarrassing to have a dog that doesn’t play nicely with others, so some owners will head you off at the pass by speaking to their dog loudly enough so you can hear. Any comments like “be nice” or “it’s ok, Rufus” should be understood as subtle warnings to please keep your dog from getting too close. If none of these signals are obvious, when in doubt, ASK “can we say hi?” But be prepared for the possibility that the owner will say no. This has nothing to do with your dog – do NOT try to convince the owner that your dog is friendly or gets along with everyone – accept that they know their dog’s threshold better than you do and move on.